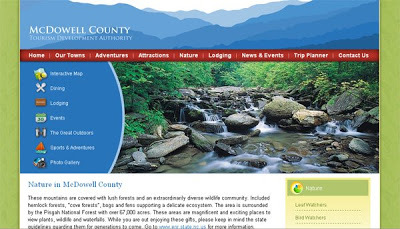 McDowell County Tourism Development Authority has a very eye catching new website showcasing the area’s history and features, plus all the different activities in our county, from hiking to birdwatching to sightseeing along the Blue Ridge Parkway. We also liked the sections about the railroad and the North Carolina Civil War Trail, as well as the section devoted to suggested itineraries. If you’re looking for things to do in McDowell County, this is a fantastic resource. This entry was posted in Uncategorized and tagged birding, Old Fort / Andrews Geyser, outdoors by Inn on Mill Creek. Bookmark the permalink.